U.S. Rep. Rodney Davis (R-Ill.) announced that Laura Lecybil, a senior at Springfield High School, was selected as the winner of this year’s 13th District Congressional Art Competition. Lecybil's submission, "Chance of Precipitation…Zero Percent,” was selected by Jenny Cowgill, Decatur Arts Council Education Coordinator, from among 30 entries submitted by area high school students. The artwork will be displayed in the U.S. Capitol in Washington, D.C. for one year. Lecybil was also be invited to attend the official ceremony honoring Congressional Art Competition winners from across the country in the spring in Washington, DC. Never in her life did Laura expect that taking a fun, high school photography class would lead to such an exciting time during her exchange year. When she first heard that she had won the award her response was “But I’m German”. Laura’s award included 2 free airline tickets to D.C. to attend the Art Competition’s official ceremony. 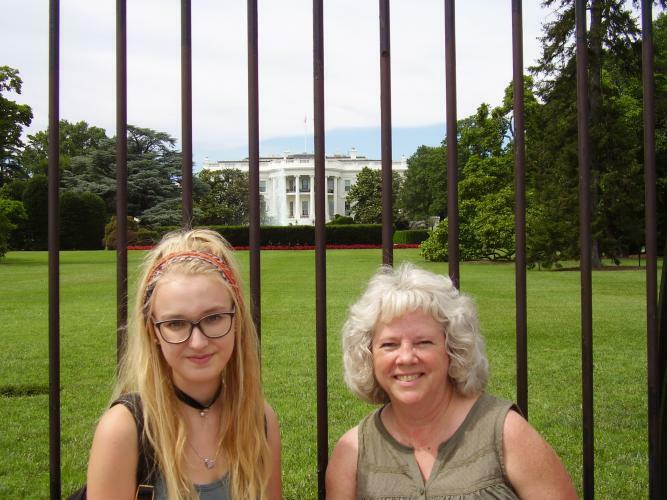 Laura and her host mother, Sheryl Meyer, of Springfield, Illinois were able to enjoy a quick 2 ½ day trip to D.C. during Laura’s last week in the U.S. to be recognized for her photography award. During the trip, Laura was able to enjoy a tour of the nation’s capitol, sit in the House of Representative chambers, see the White House, tour many national monuments and visit the Air & Space, Holocaust and National Art museums. She also was able to meet Congressman Davis and get a picture with him. A big thanks goes out to Laura’s art teacher for submitting her picture for the contest.